See the featured quilts and web-exclusive color options and projects from the American Patchwork & Quilting June 2017 issue. 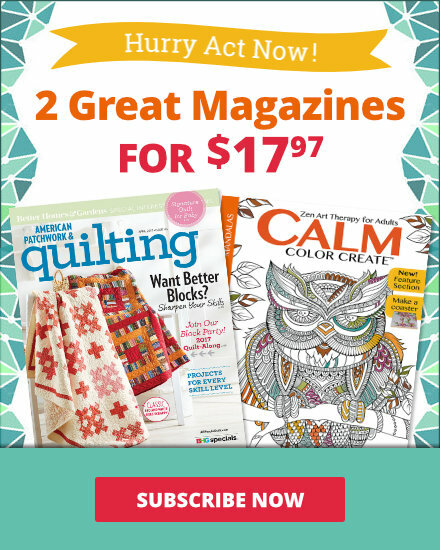 The June 2017 issue of American Patchwork & Quilting is on sale from April 4--June 5. A low-volume background adds calm to a graphic throw composed of assorted warm and cool prints. "I love classic color combinations in my quilts, especially black and white, which can easily match any room in my house," says Lindsay Mayland, assistant multimedia editor. "Metallic gold accents add sparkle." Pump up the volume with bright blocks that look like sound waves when pieced together. A gray background allows the colors to sing the loudest. Warm breezes, a lakeside view, and a good book are the perfect recipe for a relaxing afternoon on your favorite quilt. Traditional fall colors mix surprising well with aqua, pink, and coral for a picnic basket quilt that has autumnal style. Assistant art director Elizabeth Stumbo used the back of a print for the background of her contemporary version of Patchwork Picnic. "Get creative," Elizabeth says. "Don’t be afraid to consider the reverse sides of fabrics." 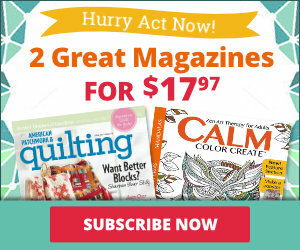 We’re revisiting some of our favorite projects from the American Patchwork & Quilting magazine vault as we look ahead to our 25th anniversary. This quilt is the second in a series of six. 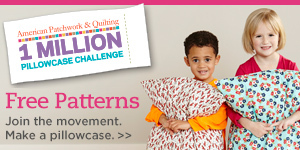 It’s been updated to work for today’s quiltmaker. The original instructions for Log Cabin were published in our April 2005 issue. In Antique Log Cabin from quilt collector Julie Hendricksen, the A and B blocks are oriented so the light prints and dark prints do not align across the quilt top. If you prefer a symmetrical look, make all A blocks or all B blocks. Also, this quilt has a border, which was omitted from the featured quilt. Associate editor Lisa Schumacher used solid fabrics in a controlled cool palette of blue and purple and an equal number of A and B blocks in her updated version of Antique Log Cabin, above. She positioned her blocks in vertical rows, with the A blocks in the center rows and the B blocks in the outer rows. Create candy-color blocks that pop against a bright white background. Design director Nancy Wiles made a Christmas-theme color option. "To keep the quilt from getting too busy, I positioned the blocks in rows of red, green, and gray," Nancy says. "I cut setting squares of the animal print panels and placed these focal points in the middle two rows." Designer Annette Plog swapped blocks with quilting friends to gather blocks composed in a variety of blue reproduction prints. 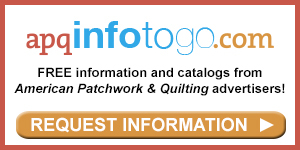 To order a kit of fabrics for quilt top and binding for $125.99 plus shipping in U.S. (Nebraska residents, $134.81), contact Quilted Moose, 109 Enterprise Dr., Gretna, NE 68028; 402-332-4178; quiltedmoose.com. Combine reds, pinks, and purples into a five-block wall hanging that exudes feminine style. Fun stripes, dots, and floral prints are playful against a gray background. 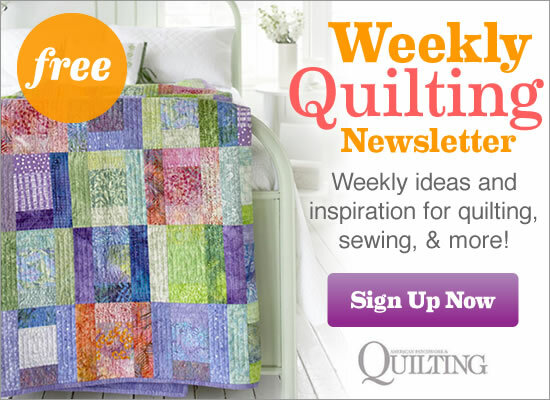 "I love scrappy quilts! In this table runner, each block has 33 different fabrics," senior editor Jody Sanders says. "Only the centers are the same. I used a red paisley in the center of each block and a blue paisley in the border to give the eye a place to rest. As I pulled fabrics from my scrap box, I had fun remembering where some of the fabrics had been used in previous quilts." Learn a simpler way to assemble a star point unit: Piece three triangles and trim them into a square. "I love the idea of using really bright fabrics paired with a neutral, specifically gray, to help balance out the overall look," graphic designer Alison Gamm says. "The textural gray also gives your eyes a place to rest." Quilt tester Laura Boehnke played with fussy-cut fabrics in her version of Hummingbird Nine-Patch. Woodland creatures peek out in the Nine-Patch blocks and border squares, and a chevron design radiates from the star centers. A warm color palette of brown, cream, and orange complements the forest motifs, with pink and coral adding a touch of brightness. Floral motifs on the tile in a kitchen backsplash inspired the appliqué shapes in this quilt. Skinny strips mimic grout. Editorial content chief Linda Augsburg used a panel print for her background and tone-on-tones for the floral motifs. "I selected a fabric that looks like wrought-iron fencing," Linda says. "When cutting apart a panel print, it is important to keep pieces organized on a design wall so they are assembled in the correct position." Fabrics: Gemstone Batiks by Color Principle for Henry Glass & Co.
Laura’s color option Yellow batik mimics the sun shining through a stained-glass window in this version of Flower Trellis. Quilt tester Laura Boehnke used mottled batiks to give the illusion of colorful glass. This basic block will inspire you to start your next charity quilt because you are #SEWgiving! By fussy-cutting portions of some fabrics, quilt tester Laura Boehnke added visual interest to a nine-block wall quilt. "I like to decorate with monochromatic blues, greens, and grays that are subtle but not drab," executive editor Karman Wittry Hotchkiss says. "I used a package of precut 5" squares plus a few additional scraps to make a table runner."